Custom Embroidered Ladies T-shirts, V-neck, Scoop, 3/4 sleeve, Stretchy tees and Basic. Custom Embroidered Ladies T-shirts, V-neck, Scoop, 3/4 sleeve, Stretchy tees and Basic. Brands such as Hanes, Gildan, District Made, District, Port Authority, Sport Tek and Port & Company to mention a few fill this page. Each style designed for a beautiful custom embroidered logo of your choice which is included. Ladies stylish fit, taylored to what women want in a custom embroidered t-shirt. Including the new modern fit stretchy tee. Taylored for women, flattering fit! Comes embroidered with your logo in stretch fit fabrics! 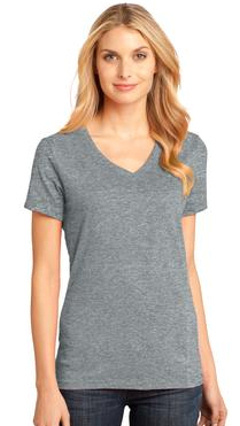 Port & Company® - Ladies 100% Cotton Essential T-Shirt. LPC61. 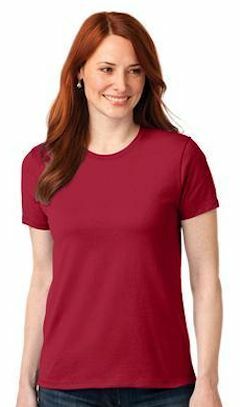 Custom embroidered Port & Company® - Ladies 100% Cotton Essential T-Shirt. LPC61. With its incredible range of colors-not to mention its tremendous value-you're sure to find an Essential Tee that's perfect for your group. 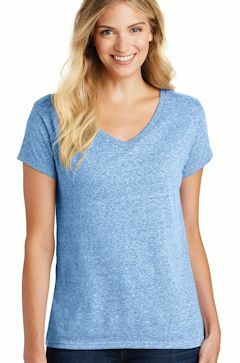 Heavyweight 6.1-ounce, 100% cotton constructed with an exacting eye for quality, Shoulder-to-shoulder taping, Coverseamed neck, Shorter cut throughout the body and sleeves for a more feminine fit, Double-needle stitched hem, Custom Embroidery Included. Custom embroidered Gildan - Ladies Ultra Cotton T 100% Cotton T-Shirt. 2000L. 6.1-ounce, 100% cotton (preshrunk jersey knit). Seamless double-needle 7/8" collar. Double-needle sleeves and hem. Taped neck and shoulders. Feminine-inspired styling. Sports Grey 90/10 cotton/poly. Saftey Green and Saftey Pink 50/50 cotton/poly Custom embroidered logo included. Custom embroidered District ® Women's Medal V-Neck Tee. DT664 - A personal Favorite! 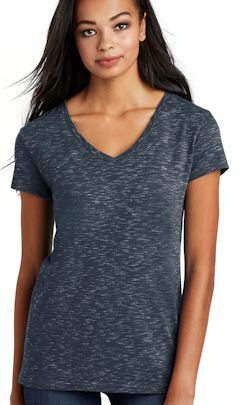 Hanes® Ladies V-Neck T-Shirt. 5780. 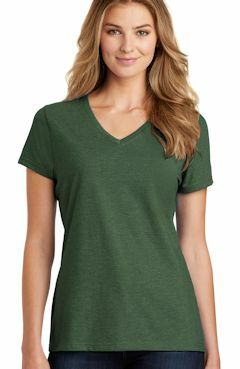 Custom embroidered Hanes® Ladies V-Neck T-Shirt. 5780. An exceptionally smooth hand from ComfortSoft cotton. 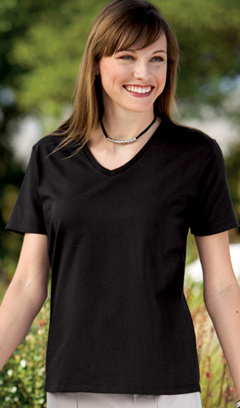 This custom embroidered V-Neck T-shirt is comfortable and stylish. Shaped through the body and sleeves for a feminine look. 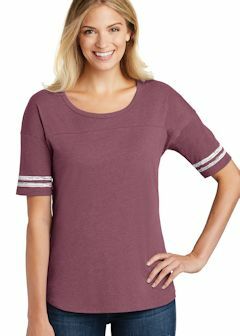 5.2-ounce, 100% ComfortSoft cotton, Narrow 1 x 1 rib knit collar, Double-needle abbreviated sleeves and hem, Custom embroidery included. A tee made to go with nearly everything in your closet? Perfect. 4.3-ounce, 100% ring spun combed cotton, 30 singles. Custom embroidery included.